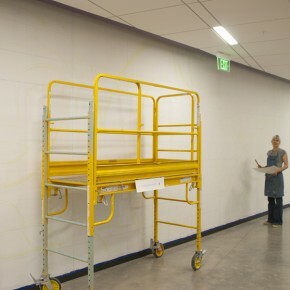 This month we’ve taken you to South Salt Lake, for a look at their public art (see the photo essay in the September 2013 edition of 15 Bytes), talk of the city’s future as an art locale (see our September 10th post), and, coming up, the Poor Yorick Open Studio event. Well, once you’ve crossed I-80 to visit the city to the south, consider wandering a bit east as well. Abutting South Salt Lake to the east, Millcreek is not a town proper (and if you’re smart you won’t ask the locals about the controversy over incorporation), but it has its own unique artistic flourishes: there’s Evergreen Gallery on 2100 East, and the Flynn Artipelago a couple of blocks away (see our article). 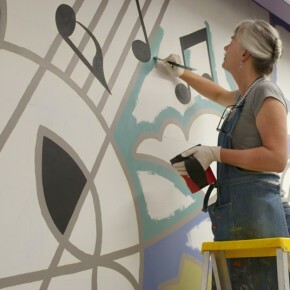 In the same your neighborhood you’ll find the Millcreek Community Center, where the Salt Lake County Public Art funds have been hard at work. 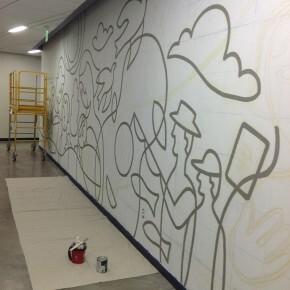 The process started with preparing the 10 x 48 foot wall with a grid, drawing the mural design to scale on the wall, painting the linework and then painting the rest of the sixteen colors. 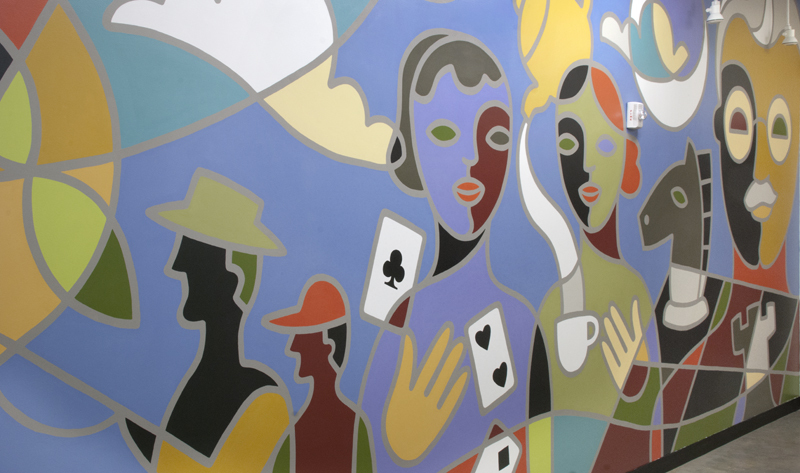 The imagery in the mural is symbolic of intergenerational relationships and evokes the emotions of shared experience by portraying people of different ages and backgrounds together. 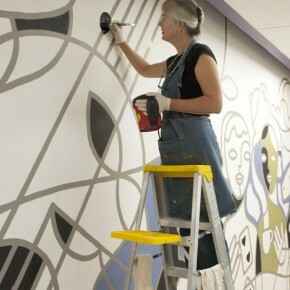 The art was made possible through the Salt Lake County 1% for Public Art Program. 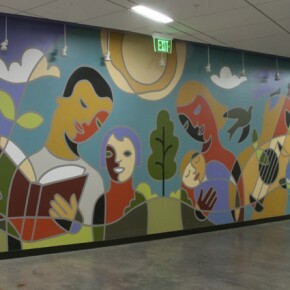 You can view the mural at the Millcreek Community Center during regular hours. Traci O’Very Covey was born in Salt Lake City and received a Bachelor of Fine Arts from the University of Utah. 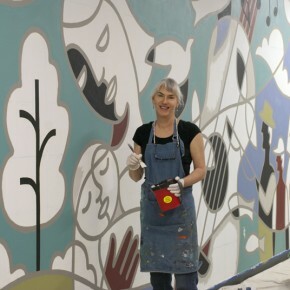 Aside from her fine art career, she has been an award-winning graphic designer and illustrator for over 20 years. See more of her work at tracioverycovey.com. Bravo to Traci! Well done! I love how she has weaved together all the various elements of senior life and leisure activities – cards, chess, afternoon tea, music, children, books, etc.. And such a positive upbeat rhythm to the design.